My scooter skimmed about the surface so fast the ground blurred, kicking up a wake of dust that hazed from the color of dried blood to beige, depending on the angle of the light. Ahead, rust-colored hills made chocolate-colored shadows. The plains before the hills were tan, but in a few hours they'd be vivid, blush-colored, beautiful. Right now, the sun was low, a spike of light rising from the rocky horizon in the early morning. The sky above was pale cinnamon. He seemed to expect me to respond to all that. Maybe I should have told him I wanted to be left alone after all. "I didn't think much about Earth at all until a couple of weeks ago. I have no idea what it's like." Was everyone at Galileo Academy going to be like this? "Going to Earth wasn't my idea." Homesick and cut off from her plans for her future, Polly cannot seem to fit into life on Earth. Strange, unexplained, dangerous coincidences centered on their high-profile classmates begin piling up. Charles may be right―there's more going on than would appear, and the stakes are high. With the help of Charles, Polly is determined to find the truth, no matter the cost. I tend to avoid Sci-Fi, but this one does sound tempting. Thanks for sharing, and for visiting my blog. I love the descriptive detail of colors in the opening paragraph. Enjoy the read! That's beautiful descriptive writing. I'd like to read more just for that reason. The first snipet is quite the description. Marian's Abroad looks interesting. I love the cover. I have yet to read the Kitty series! This one sounds good too. The intro is very descriptive. I'd keep reading. Ooh nice teaser! Didn't read this one though I do enjoy Carrie's books! Still gotta finish the Kitty Norville series! Hope you enjoy the rest! I'm reading a book about living on Mars. I think it would be fun to read this next as it's about coming to Earth for the first time. Such a beautiful, descriptive beginning too. I don't usually read science fiction, but this does sound like a good one. Never read sci-fi but sounds interesting! Nice opening and good teaser. It really shows something of the character. Thanks for coming by! Martians Abroad sounds interesting! Thanks for sharing and hope you enjoy it. 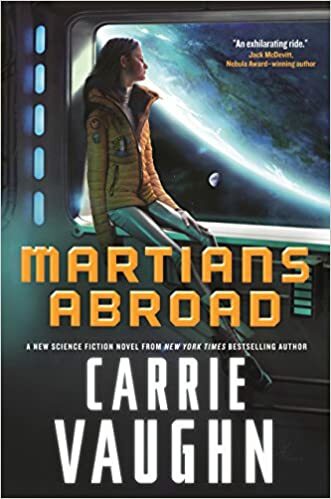 Martians Abroad does sound like a fun, interesting read! It's funny to think that going to Earth is considered a big deal - I'm pretty interested in finding out how we came to be on Mars.